WITH YOUR DONATIONS CLEVIS RECEIVED MEDICAL, NUTRITIONAL, COUNSELLING AND SOCIAL SUPPORT TO HELP HIM GAIN ALMOST 9KGS IN 3 MONTHS. ​When an individual isn't regularly tested for HIV and their diagnosis comes late after the initial infection their immune system is compromised by the Virus. This is what happened for Clevis who came to the TTF Clinic in 2016, aged 16. Having never previously been tested for HIV his immune system was suffering, he was incredibly malnourished and was suffering with a lot of HIV related illnesses. After testing as HIV+ he was immediately started on HIV treatment and, thanks to the support of 79 individuals who donated to our CaringCrowd Crowdfunding campaign , he was enrolled to receive weekly food packages, nutritional education, supervised palliative care and weekly counselling to help him to understand HIV and the importance of medication to lead a healthy life. 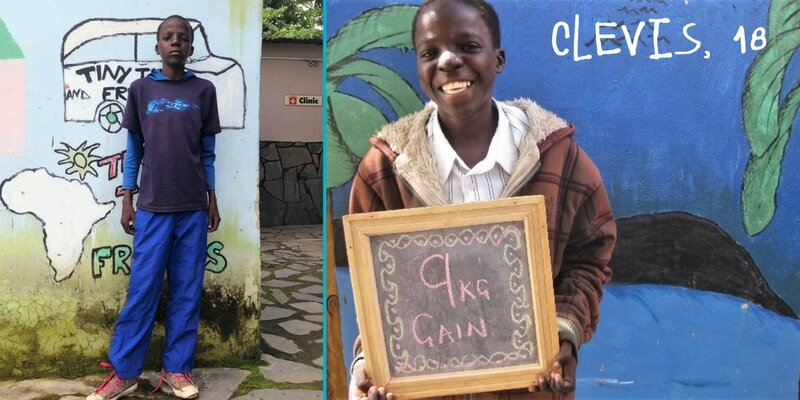 Within 3 months of being on the nutritional support program Clevis had gained almost 9Kgs (20lbs). The other infections impacting his body began to clear up and he started to have a lot more energy. His immune system began to recover and with in-depth counselling he was able to start to understand what it means to live with HIV and the importance of taking your medication as prescribed. This also meant he was able to achieve viral suppression - meaning the virus isn't detectable within his bloodstream. With an undetectable viral load he can live a very healthy life as his immune system continues to recover and and his likelihood of transmitting the virus is reduced to zero. Whilst Clevis still has a long way to go in becoming well nourished, gaining weight and getting well with your donations we are able to quickly support him in his path to recovery.